60W Tesla Nano TC Box Mod is one of pocket-friendly device which meanwhile built-in 3600mAh internal battery. Measuring 25mm in diameter of the MOD’s top, Tesla Nano is perfect for most 510 thread subohm tank and rebuildable tank. 60W Nano TC MOD comes a top style fire button, a bright and readable OLED screen, and on-board USB charging, the Tesla Nano 60W TC Box Mod is perfect for all types of vapers. This comfortable and powerful mod is perfect for any vapor, not only the beginner the but also the advanced user. Its chipset has built-in protection features to keep your battery safe, and ensure a safe vaping experience. Featuring maximum 60 wattage and TC mode, Tesla Nano box mod is compatible with almost any of low resistance coils. The temperature range from 100℃ to 300℃ will provide smooth airflow and pure e-juice taste. Small size with 3600mAh build-in battery! Great design! A very good product from Tesla, and the service of this store is nice. 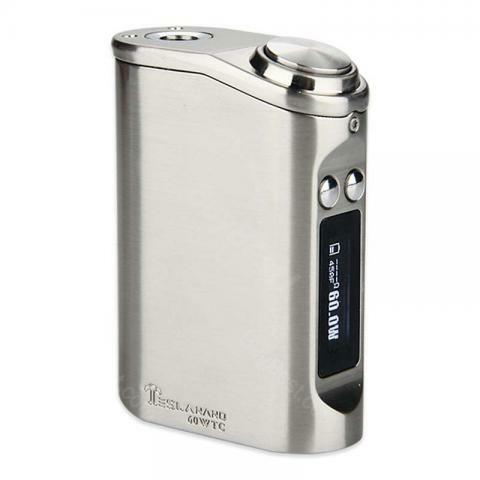 High quality manufactured, small mod, excellent finishing, fast shipping and great price. I really like this Tesla Nano TC MOD. Tesla Nano TC Battery MOD is nice. Build quality, great battery life and good paint finish. The size of this Tesla Nano TC mod is very handy. Small yet powerful and the battery last long.